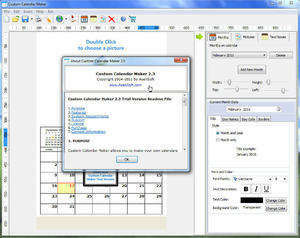 Custom Calendar Maker allows you to make your own calendars that you can customize with your pictures and photos. You can add your personal events, save your customized calendar to a bitmap file or print it to paper. Some features available are: make photo calendars with your images,define personalized events,edit your photos and add special effects to them. For security reasons, you should also check out the Custom Calendar Maker download at LO4D.com which includes virus and malware tests. Additional screenshots of this application download may be available, too. 4.38 out of 5 based on 8 ratings. Custom Calendar Maker has a presence on social networks.